Being a postgraduate has many similarities with being an undergraduate and shares all of the academic tools but there are some significant differences. Studying as a postgraduate can be something of a shock after the undergraduate experience. As an undergraduate you are part of a class studying the same subject with other students, it is a very social experience where friendships and communities are formed, it is also a fairly structured experience with a formal timetable and curriculum and designated rooms and spaces. Taught postgraduate courses such as MAs or MScs can share a lot of the elements found in an undergraduate programme and many students see Masters course of this kind as essentially a 4th year of their degree. Indeed, Scottish universities such as Edinburgh, for example, only offer 4 year MA programmes missing out the 3 year BA or BSc entirely.That said a one year Masters course can seem rather flat after the excitement of the first 3 years of an undergraduate programme. If you choose to continue studying at the same university that you did your first degree at, you may find it odd if all your old friends have moved on and you are studying in the same place with a bunch of new people who you only have a year to get to know. That said you will have the advantage of local knowledge and an existing relationship with your tutors and other university support staff. Choosing to move on and continue your studies elsewhere may have the advantage of a fresh start but once again you will have the challenge of establishing new relationships, but also getting used to new facilities and teaching staff. There are good reasons for both options and it is really up to you to reflect on your own personality and make an informed judgement as to which option will work best for you. Where the postgraduate experience can become most shocking is at the level of MPhil or PhD where you are, for the most part, working alone with little in the way of formal structure to help guide your day-to-day study aside from your own will power. Humanities and Social Science PhDs are especially prone to this, while science programmes can sometimes have the benefit of involving group work. The life of a research student can be a very isolated one indeed. Drawing on your previous undergraduate experience to help establish your own unique patterns of work and study routines, will be of immense help in keeping you focused and on track. It is important to keep in mind that a PhD requires you to play the long game, it is a marathon and not a sprint. It has a long term objective that you will be building up to slowly and carefully. Select the right supervisor: Choosing the right supervisor for you and your work is quite possibly the most important postgraduate decision you will make. We say "for you and your work" quite deliberately as a supervisor needs to be a good fit not only for the subject area, but also for you personally. Trying to work with a supervisor who is brilliant in their field, but for some reason irritates and annoys you is a recipe for disaster. In many ways a dedicated and knowledgeable supervisor who is eager to work alongside you and who has a reputation for bringing the best out of their students, is a better prospect than a supervisor who is perhaps an acknowledged expert in their field, but may be too preoccupied with their own research to give yours the necessary time and support. The rule of thumb here is don't blindly chase academic reputation, do some preparatory research into the reputation a tutor has as a supervisor, not just an academic. I have been driving for years and consider myself to be an excellent driver, but my daughter would be a fool to ask me to teach her to drive. Craft your research proposal: Writing any extended piece of work - a dissertation or thesis - will require careful attention to structure if you hope to keep control of the project and give it the sharp focus that advanced research projects demand. For this reason creating a coherent and realistic proposal is a vital part of the research process. It is a delicate task that requires skill, clarity of thought and attention to detail. It is not simply a matter of jotting down a topic that interests you and adding a bit of a reading list. A good research proposal does not just get you a place on a postgraduate research programme, but will also serve you well in keeping the whole project under control. Keep in mind that, for the most part, a postgraduate thesis needs to be problem centered so your proposal needs to frame the question or cluster of problems you plan to address very clearly. You need to be demonstrating that you have not only identified a question to be tackled, but that you will be suggesting a unique approach to dealing with this question. Remember that originality is a vital component of work at this level. Understand Originality: As undergraduates it is often the case that we feel as if in every essay we are saying something unique, something never before thought or said. We soon learn that, for the most part, it is our lack of familiarity with the complexity of our chosen subject that creates this sense of having discovered something new. As our understanding develops we fast come to realise that study at this level is designed to introduce us to the basics of our discipline and that rather than these things being new as such they are simply new to us. This, of course, is a very exciting and stimulating thing and a necessary step on our academic journey. When one reaches the level of PhD candidate then the demand for genuine originality becomes a very real one. The issue of originality often confuses and concerns PhD students as the terms is far from unambiguous. How new does an idea have to be before it counts as being 'original'? Does your research data have to be 'primary' before it, and its conclusions, can be considered 'original'? Does extensive use of the work of others compromise 'originality' in some way? How much 'original' content is enough for a PhD? Gill, P., & Dolan, G. (2015). Originality and the PhD: What is it and how can it be demonstrated? Nurse Researcher, 22(6), 11-15. As we can see from this originality can relate to a wide range of research activities, just look at some of the key words above - new, adding, techniques, testing, interpretations, applying, context, synthesizing, exploring, All of these terms have a legitimate and significant impact upon the originality of a piece of research. Manage Expectations: To be perfectly blunt it is often very easy, on beginning a PhD for example, to get an over inflated sense of its significance in the scheme of things. The freedom to conduct ones own research, largely self managed, on a topic that has been selected by you because you believe it to be of importance can be a heady experience especially after the curriculum constraints of undergraduate and even Masters level study. To engage successfully in a research based qualification such as a PhD it is important to maintain a realistic perspective on the process and its planned outcomes. A PhD thesis is not an exercise in having your supervisor simply rubber stamp your pet idea or theory. As we mentioned above, a well crafted research proposal is vital in helping establish a realistic and focused research project. One of the most important things to be aware of while working on a PhD, for example, is that it isn't your life's work. 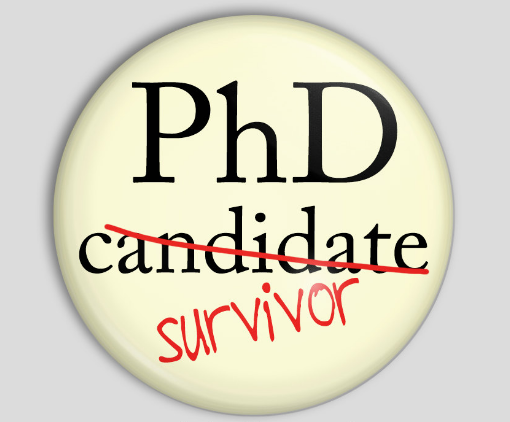 A PhD is a limited exercise, it is very unlikely to be the last word to be said on a topic, it is certainly unlikely to be the last word you will ever say on the subject. resist the temptation to try and drag in everything that arises from your research into a given topic into your thesis, be selective, stick closely to a clear set of aims and objectives in order to progress towards a sharply focused piece of research. It is almost inevitable that during the course of your research you will encounter information that, while fascinating and tangentially relevant to your topic, will not serve to progress the project significantly and at worst might actually be a distraction leading away from the wider thesis. To this end a close relationship with your supervisor is essential as it is part of their role to help keep you on track and to warn you if you start to stray to far into irrelevant waters. It is a fact that researchers can become very possessive of their work and come to see it almost as a child that can do no wrong and that must be protected from all outside influences. While this is understandable it is not desirable and can give rise to a badly behaved piece of work that is distorted, chaotic and overly subjective. While ownership of a piece of work and the conviction to pursue relevant research is certainly at the heart of any postgraduate thesis it is equally the case that regular interrogation of that work by a wider community is essential to its success. It is inevitably the case that your supervisor will have a greater insight into the the structure of a research project, the way it ought to look and proceed even if your actual knowledge base might begin to outstrip theirs in this instance. Don't be so proud as to refuse help, advice and insight, especially from those who have greater research experience - our children are not always perfect and we are not always the people best placed to see this. Time Management: Working alone on a piece of research can be a hugely unstructured experience and for some of us it can be the first time we have had to work without the benefit of an external timetable of some sort helping to keep us organised. There is a huge amount of advice available on how to make best use of your time. Simply put it is important to a) understand how time works for you and b) establish a routine that serves to structure your day. Having a clear understanding of what study time is actually available to you, especially if you have a job and/or family responsibilities, and at what times of day you are particularly effective will help you make the best use of your time. Trying, as far as possible, to treat your research as a 9-5 job can help establish a routine that encourages you to keep working even when you don't much feel like it. As with any job taking regular breaks, preferably with colleagues, is very important to keeping you sane and keeping your research fresh. It is also a valuable lesson to learn that sometimes you just need to write-off a day and go and see a film or go for a walk or shop for shoes. There is no virtue in sitting at your desk staring at the same screen or the same page for hours, this will only make you feel guilty that you've "wasted time" it is often better to cut your losses and take the day off, chill for a bit, and return to the work the following day. A postgraduate course of study, especially one based primarily on individual research such as an MPhil or PhD, is by its very nature a demanding experience that requires a high level of maturity from those embarking upon it. Self-reflection. confidence and resilience are as necessary to a postgraduate student as are more obvious academic abilities. Being aware of ones own particular strengths and weakness along with ones most productive study style will be vital in establishing effective and personally tailored research practice. Being prepared to defend ones own unique perspective in front of peers and expert tutors will be as important as the ability to take sometimes devastating critiques of your most cherished opinions with quiet dignity and grace. The postgraduate experience can become a very shocking one, especially at the level of MPhil or PhD where you are, for the most part, working alone with little in the way of formal structure to help guide your day to day study aside from your own will power. Humanities and Social Science PhD's are especially prone to this while science programmes can sometimes have the benefit of involving group work.The life of a research student can be a very isolated one indeed.Drawing on your previous undergraduate experience to help establish your own unique patterns of work and study routines will be of immense help in keeping you focused and on track. It is important to keep in mind that a PhD requires you to play the long game, it is a marathon and not a sprint, it has a long term objective that you will be building up to slowly and carefully.